Nevertheless you arrive for a day or two or for a long stay, you could turn Rilets Resort & Spa in your baseline for mountain hikes and excursions. The crystal clear Rila lakes, the coves, amazingly beautiful views, high peaks and quiet rivers are awaiting you. If you didn’t see the Stob Pyramids yet – visit them. They are impressive rock formations near Stob village. A real challenge is the tour to the Kirilova meadow which is at 1465m altitude. We are now preparing suitable pedestrian routes and eco-paths for the mountain enthusiasts. We organize excursions for the remoted destinations. Our target is to provide possibilities for rock climbing, and we marked the suitable places out already. We provide equipment and instructor. We are working also on spectacular routes for jeep safari as well. There are so many things to do in the summer in the mountain. We can take you fishing, wild plants, birds and animals exploration; a motorbike walk or we can show you our pedestrian paths to the 7 Rila lakes. We’ll show you also how to go through the same routes in snowshoes. 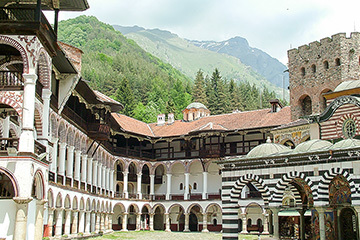 Don’t forget that the hotel is only several hundred meters from the Rila Monastery and there is also the St. Ivan Rilski tomb close to it. When you go back tired of adventures the Spa treatments and the delicious food will help you recover fast and be ready for the next day.